I feel like my base is probably one of the most important parts of my makeup look. A base product can either make or break my face, so if my base looks bad, I feel like my entire makeup look will look bad too. This of course is why buying new base products gets me a bit nervous, as they are often either a hit or miss. But luckily, my recent purchases are serving me well, so I thought you might like to know a bit about them. First up is the Maxfactor Face Finity All Day Flawless 3 in 1 Foundation. It claims to have a primer, concealer and a foundation all wrapped into one product, which is a clever concept, but I don’t use this foundation for the purpose of skipping primer and concealer. In some areas of my face this foundation does act as concealer due to its high coverage. The only areas of my face that I ever feel like I need to put a bit of concealer is under my eyes, to help bright my face up a little, or on a large blemish. This foundation does last well on my skin, but whether it can be used as a primer in itself, I’m not so sure. Foundation tends to slip off around my jaw and chin the easiest so I do like to apply a separate primer to make sure it lasts. This foundation has a matte finish, however even works on my dry skin. If I have an especially dry patch, then it may cling a little, but apart from that it sits nicely on my skin and doesn’t look powdery or cakey. It give me that feeling of flawless skin as it covers up most blemishes and my redness amazingly, so it’s a win win! Next is the Real Techniques Miracle Complexion Sponge. This is the first sponge I’ve ever used, and I am very pleasantly surprised about how good this little baby is; it really does give me a miracle complexion as the name suggests. 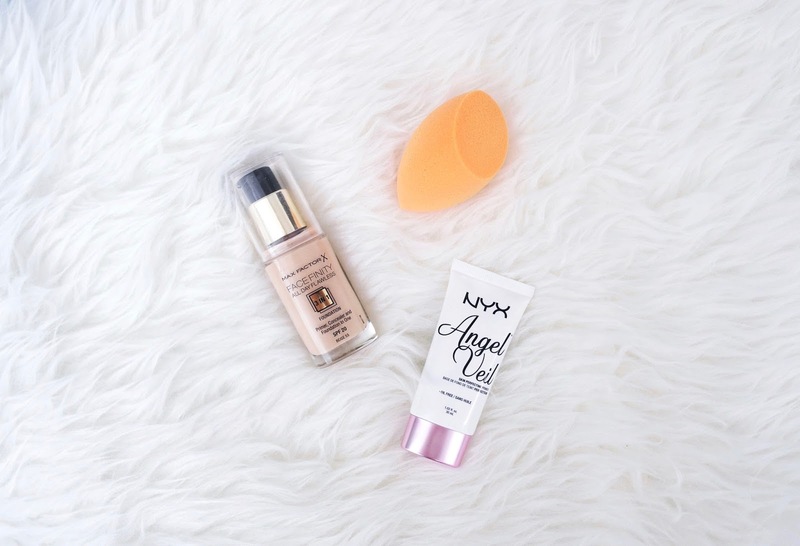 Applying my foundation with the sponge slightly damp diffuses foundation so evenly onto my skin and gives me a smoother and more flawless finish compared to when I use a brush. The 3 different surfaces on this sponge helps make sure foundation gets into all the small areas of the face too. It’s slightly harder to clean and doesn’t wear as well compared to a brush. But, this sponge is incredibly affordable and of good quality, so replacing it wouldn’t be a problem at all. Finally is the NYX Angel Veil Skin Perfecting Primer. This is the first primer from NYX I have tried, and I have to say it lives up to all its good reviews I read online. The primer is white, which at first seems a little scary, however it blends out beautifully. You only need to apply a very small amount and a little really does go a long way. It has a lovely silky texture, which almost feels quite moisturising, but at the same time doesn’t make the skin feel tacky at all. It really helps combat any oil on the skin as well. I don’t have particularly oily skin, but can get oily in my T-zone and I feel like it keeps these areas matte well. In terms of keeping my makeup in place, it does a good job. The silky finish to this primer means that my foundation doesn’t move around as much, and also helps my foundation sit evenly on my skin, which in turn helps to fight patchiness for longer. The price tag is at a slightly higher price for a high street brand at £12, however does a great job so is definitely worth it. Have you tried any of these products? What base products have you been using lately?